Soft plastic waste is a significant problem facing modern society. Local initiative Plastic Police® is addressing this issue by creating a local community engagement model to collect, recycle and reuse soft plastics that end up in landfill and continue to pollute our local land and marine environments. 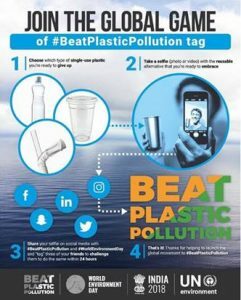 Tuesday, 5th June 2018 is World Environment Day and this year’s theme is “Beat Plastic Pollution”. Plastic Police is asking you to become aware AND involved in this significant call to action; for all of us to come together to combat one of the greatest environmental challenges of our time. We have to start somewhere! This year’s World Environment Day provides an opportunity for each of us to embrace the many ways that we can help to combat plastic pollution around the world. And you don’t have to wait until 5th June to act.